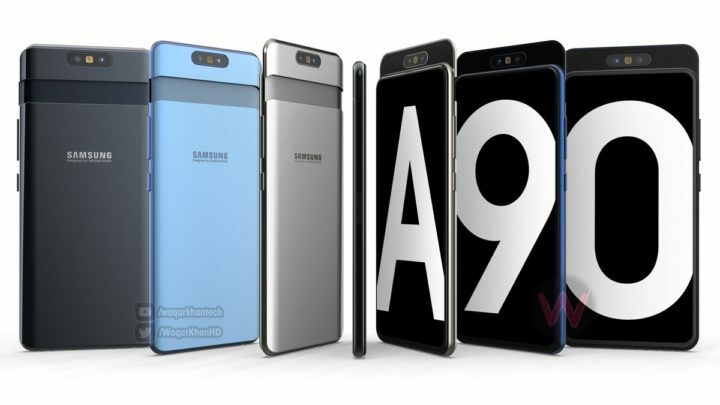 A new concept video from a 3D render has surfaced online showcasing the pop-up camera system on the Galaxy A90 from Samsung. It is already confirmed that the Galaxy A90 is arriving in the UK together with two new handsets, Galaxy A20e and A40. It is also rumored that the device will be an “Ultimate Gaming Device”. The phone is said to feature a notch-less infinity display and will launch with a new camera system. The pop-up camera system in the video shows the camera is mounted on a frame that slides up when the front camera function is toggled from the camera app. Once the frame finishes extending upwards, the camera which is originally mounted for taking rear pictures then rotates to become a selfie camera. The video started circulating online soon after the Chinese tipster Ice Universe, posted a tweet on their twitter account with a link to the Galaxy A90 concept video. The Samsung Galaxy A90 is said to arrive featuring a 6.7-inch big screen with Snapdragon 700 mobile processor. It is also said to have 6GB of RAM and a 3700 mAh battery size. This phone may remind you of the smartphones like Vivo NEX or the Oppo Find X, as the design of these handsets hides an important feature inside them. Samsung has not officially confirmed about the design of the Galaxy A90, but we will soon find out.